The history of Soupy Island is what makes Soupy Island a special place to go. It was a place for children to go during the Great Depression. Kids could still have fun while everything else was going on, ride some rides, and a get a free bowl of soup. The same stands true today. Children from all walks of life can come to Soupy Island to get some free family fun, and a free bowl of soup and a milk. When we went to Soupy Island I had never been on a carousal as fast as this one! It was hand-cranked by someone and it played music. During the ride you can view pictures of all different cartoon characters that someone had painted over the years. Soupy Island is completely free and run by volunteers over the summer. My son has even seen one of his school teachers there helping out. The children loved the smaller pool. They could run and splash through-out it. When it was time for lunch each of the children got a bowl of alphabet soup with chunks of carrots, potatoes, and chicken, a pint of chocolate milk, and some graham crackers. It was a great treat because I didn’t have to worry about packing a lunch, buying lunch, or trying to find a debit machine. It was like a park, playground, and small amusement park all in one and completely free. My children have been begging me since last summer to bring them again. Soupy Island is only open for 6 weeks after July 4th so don’t forget to schedule this sometime during your summer fun. Listed below you will find a picture with the detailed operational schedule of the pool and facilities, because they are only open during certain time periods during the day. We went on a less crowded day. We went when it was overcast and drizzling there were only a few people in the park. Be sure to call ahead of time to make sure the park is still open despite in-climate weather. This is such a fast slide and even faster with wax paper. It is open for 6 weeks after the 4th of July on Tuesdays, Wednesdays, and Thursdays. Soupy Island will close for the season on August 10, 2017. For large groups, please call ahead of time to 856-845-2430. Is there a life guard for the pool? Woodbury Public Schools would go every year to celebrate the last day of school and back then Mom’s wrapped your sandwiches in waxed paper which we then used on the fabulous slide znd Mom would always get us our new bathing suits for that day!! !-now I will have to tell my 2 sisters it’s still open so they can take my Great nieces and nephews!!!! In Red Bank elementary school, Verga School and Oakview School, our class would go to Soupy Island for a class picnic in May. 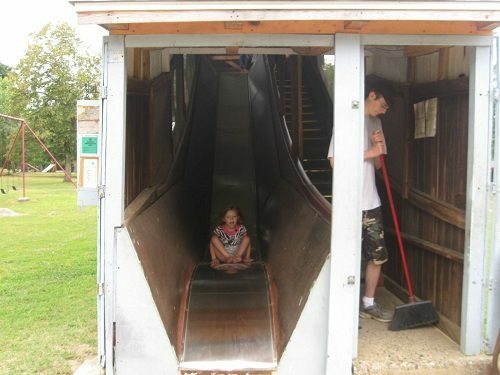 I am 71 years old and still remember the fun we had at Soupy, especially the covered slide. Always bring waxed paper for a better ride. I’m 55. I went there as a child. Does anyone else remember small monkeys? I remember feeding them peanuts. I remember when I was a kid back in the 50’s. We used to ride a ferry boat over to the Island from Philly. They would give us soup and crackers as well as a chunk of cheese. I can’t remember much more than that. I took my children there when they were younger. My oldest is now 34. Can’t believe it is still there. What a wonderful place. It’s nice to know that places like this still exist. There is still a lot of good in America!! Is Soupy Island still open?